Cancer development has long been recognized as a product of aberrant evolution of cell populations, inspiring the idea that phylogenetic algorithms could be a powerful tool for reconstructing progression processes in cancer. Translating that intuition into practice, however, has required extensive work on adapting phylogenetic models and algorithms to represent more accurately the many ways tumor evolution is distinct from classic species evolution. The result has been a large and growing body of problems and theory on phylogenetics as it applies specifically to cancers. This chapter surveys some of the key ideas and variants on phylogeny problem that have arisen in the development of tumor phylogeny methods. 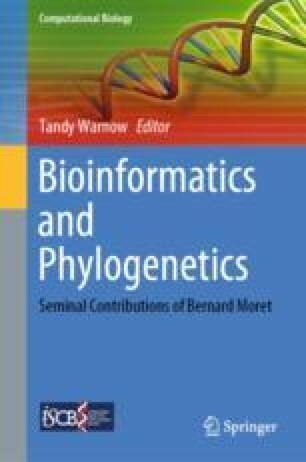 Its purpose is to introduce readers to some of the space of approaches in current practice in phylogenetics and help them appreciate how models have developed, and continue to develop, to better capture the peculiar nature of evolution in cancers. Russell Schwartz was supported in part by U.S. National Institutes of Health award R21CA216452 and Pennsylvania Dept. of Health award 4100070287. The Pennsylvania Department of Health specifically disclaims responsibility for any analyses, interpretations or conclusions.